We have started to see flocks of juveniles flying around and making chip sounds like the adults. Soon the male juveniles will start to try practice-singing like the adults, which is an unrecognizable slur of notes. 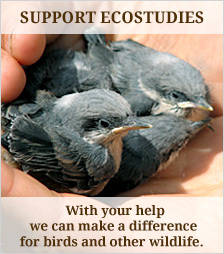 They are the same size as adult birds, but look and act quite differently. They are lighter in appearance and are only beginning to obtain the defined yellow lore above their eye, making their eye actually look larger than the adults. 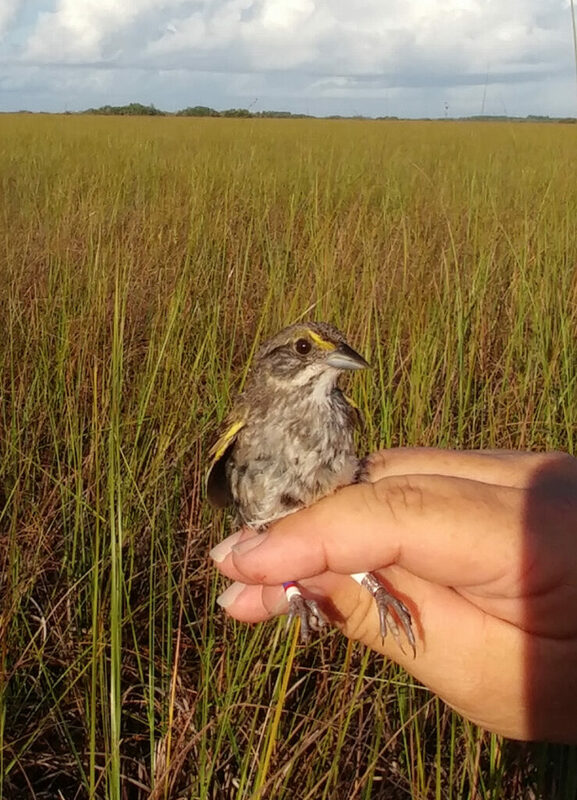 Catching and banding juveniles is one of the main activities we are involved in as the season draws to an end, as it is an important way to gather information about their dispersal and survival rates. 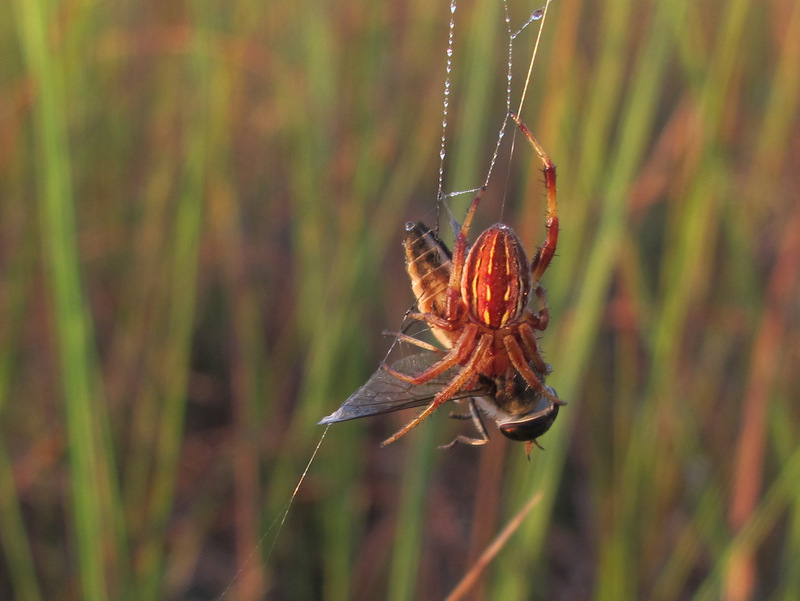 They often hang out in large groups in sawgrass clumps, which can make passive netting of youngsters a lot easier than adults. We simply set up a net next to a large clump they are likely to go to. We have also been territory mapping banded adults throughout the season. This is done by taking multiple GPS points of banded males and loading it onto ArcGIS. This allows us to look at sizes of territories and locations of individual birds. The goal for each bird is to get 30 points a season to have an accurate representation of each bird’s territory. We have reached that goal for many of our banded birds, but still will be spending the rest of the week trying to retrieve points for those that still need more. Lastly, we will still be looking for nests. Although a lot of the breeding behavior has slowed down, there are still some pairs trying to get more successful nesting attempts in. As long as the conditions are right, the sparrows will continue to try and nest. Although sparse, we are still alert to the behavior that indicates there is a nest around. 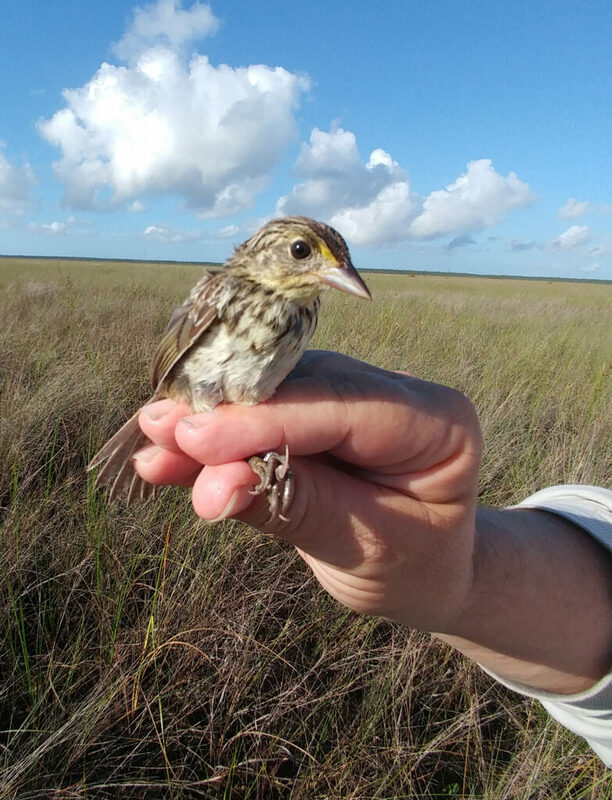 It’s been a pleasure working with the endangered Cape Sable seaside sparrow, and I am looking forward to spending my last week in Florida with these birds.